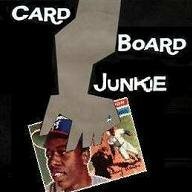 Cardboard Junkie: January Vintage Show Top 20 - #12 '59, Dude! 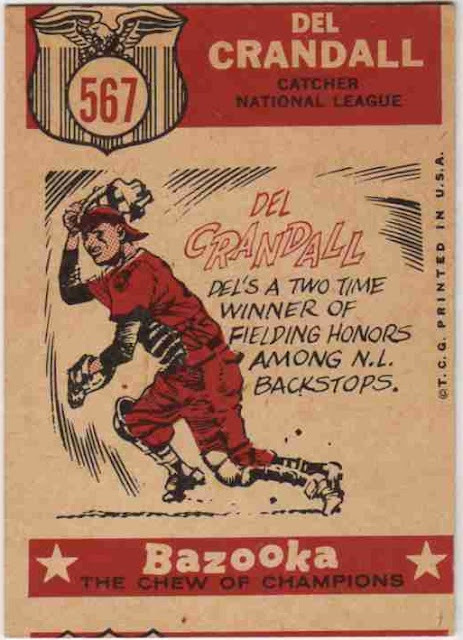 Here's the second-to-last card I need for my 1959 Topps Braves team set, a Sporting News All Star card of Del Crandall. The last card I need for the set is the Warren Spahn which I could have sworn I had already. I can almost see the thing in my hands. I don't know where or how I got it, but I really think I have that card already. However, the depression that would occur if I knew that I had a 1959 Topps Warren Spahn card in my collection but had absolutely no earthly idea where the hell it was would greatly outweigh any joy I had in completing the 1959 team set. So I'mma just say this is the second-to-last card I need and leave it at that. Maybe I should go ahead and buy that Spahn on COMC, the other one will be sure to turn up immediately. Ok, so it's miscut. That stuff happens in vintage. Judging by the teeny little sliver of color on the bottom of the card it looks like Del's downstairs neighbor on the uncut sheet was also a National League All-Star card. That miscut could actually be 1% of a Hank Aaron All-Star card! 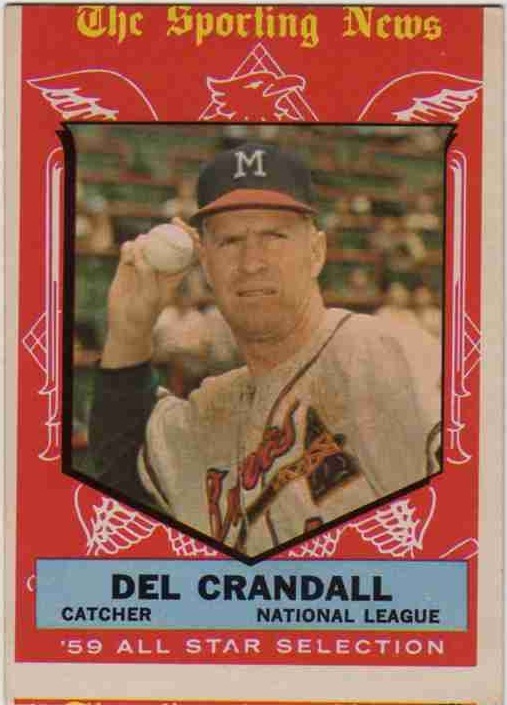 There's actually a decent chance that it is at least a Braves card as Fred Haney, Wes Covington, Warren Spahn and Hank all had All-Star cards in '59. That's what you get when you go to the World Series two years in a row. The best thing about the backs of the All-Star cards (other than the red and black ink that should have been used on the entire set instead of the Christmas colors they went with) are the cartoons. A cartoon covering almost the entire back of a card is something we should see a lot more of in my opinion. I tip my hat to whomever did the lettering on this card. That crazy Crandall font is a joy to behold. Wait, there's three different versions of the '59 Spahn? Ouch, this team set is going to take longer than I thought to complete. Here's the complete list of Top 20 posts. See if you can guess what cards are coming up! #6 - HOW THE HELL IS THIS NOT IN THE TOP FIVE?!?! #4 - Awwww, come ON. I think more '59s are mis-cut than not. After a while I don't even notice it. And the cartoons definitely are the best part of the All Star cards. yeah, no surprise I still need Spahn too. And Matthews. And Aaron. And the four All Star cards. And Rice, Willey, Roach and Pitchers Beware #34.